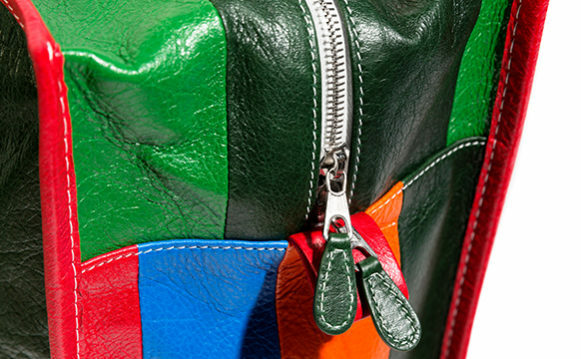 15 years after the launch of the Motocross line, Balenciaga was due for a new It bag. Last March, at the debut of his first collection for the house, Demna Gvasalia answered the call with the colorfully striped Bazar bag. Unlike other recent cult favorites like Gucci’s Dionysis or J.W. Anderson’s Pierce bag, the Bazar is not exactly a revolution in design — it’s all about utility and unpretentiousness. Many have called it a glorified reusable tote, with its design inspired by Thailand’s ubiquitous Sampeng shopping bags, named after the Bangkok market of the same name. From its oversize shape to its graphic stripes, the resemblance is obvious and has left many wondering, what’s with the $2,500 price difference? This has become something of a theme for Gvasalia whose $1,450 reconstructed Levi’s and $330 DHL T-shirts for Vetements have subverted our understanding of luxury and originality. Whether its Warhol’s Campbell Soup Cans or Moschino Barbie, the mix of high and low culture feels incongruous, yet that’s the basis of its appeal — Gvasalia’s bestselling aesthetic is about co-opting normcore, recontextualizing the mundane, and making it feel exclusive and cool. “Designers seek inspiration from all over the world,” says Senior Authentication Director Graham Wetzbarger. “Nothing is off-limits. Everything is open to re-imagination.” While, generally speaking, fashions trickle down from maisons to T.J. Maxx, this is just one example of influence trickling up. Read on as Wetzbarger explains what Balenciaga has done to improve on its East Asian inspo and what justifies the hefty price tag. TRENDS TREND TEST: PLATFORMS — HOW HIGH CAN YOU GO?